As the brightness of the computer screen hit my eyes, I could still hear the silent yell of my mother, but she was blocked out by my thoughts whizzing around in my already confused mind. Where is it, I must find it, I continually told my self. I have to find it, I acted like my life depending on it. Then I finally found the page, I did a small victory dance in the computer chair. But looked back to see if my mom saw me, I laughed to myself. Then as the instructions laid out/ I mean loaded in front of me, I staggered to the table for my dollar, and I began the journey to making............. 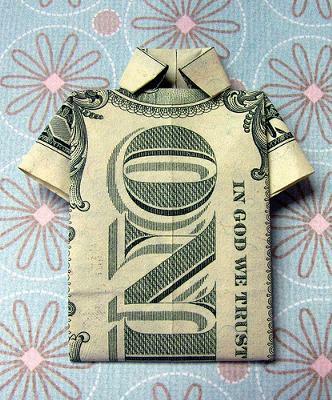 The Origami Shirt Dollar!!! Actually, the scene wasn't that intense but I was searching like crazy, When I found the instructions for the origami shirt dollar I started immediately, making sure not to rip, or mess up the dollar, in anyway. When it was time to do the collar, I messed up, and had to start again. When I finally got it right, I was so happy! The dollar shirt was so cute. Then I rushed and told my sister my mom, and I have no idea where my brother was, that's just too bad, but he would find out later. Then the next day I showed my friend, then while we were talking to her next door neighbor, my sister's bought some sodas from him, then my friend told him about the shirt dollar. That made him run in the house and get a dollar. Then he said, "Could you make it out of this?" I automatically said yes and took the dollar. But I took the dollar and made a shirt dollar out of it, they were so amazed, his jaw was practically dropping to the floor, it was just a shirt dollar. But a cool shirt dollar. As you can see I tried to improve the story, but everything in it was true!